Appsync is a Cydia tweak that signs the cracked app so that they could run on jailbroken iOS device. For example, If you download an app in your iOS device. Apple signs it so that you run it on that iOS device. That app cannot run on another iOS device. You have to buy it again. You can download that app but it will not run. On jailbroken iOS devices with Appsync installed the case becomes different. Appsync automatically signs the pirated app and integrates it with your iOS device so you can freely enjoy the app. AppSync is a must for Installous, AppCake, vShare etc. AppSync was available for iOS 6.x and 7.x. But now the older version of AppSync doesn't work fine with iOS 8. Most of the iOS 7.x users are now also facing problems of running apps from AppSync. And hence AppSync has came up with a solution. 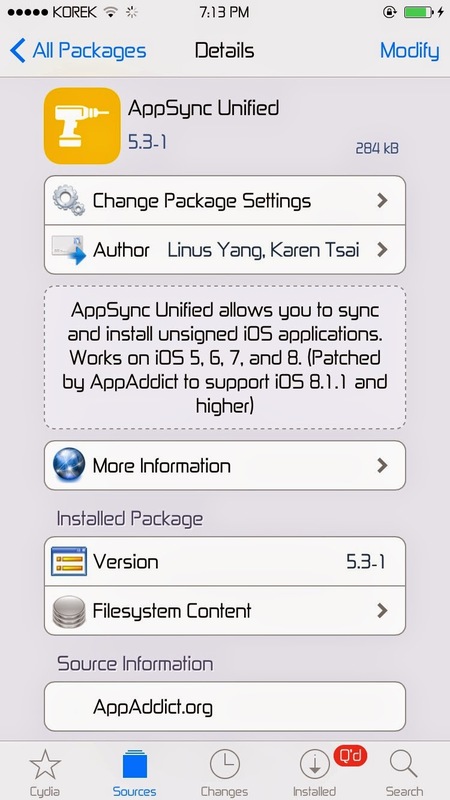 They have updated their app to release AppSync beta version that is AppSync Unified 5.3. AppSync Unified 5.3 solves the many of the problems that the earlier versions were forming. No more disappearing of icons on your springboard, no more not running of apps using the AppSync. Just download the latest updates AppSync unified version and add free cracked apps to your springboard. Here I have shared a tutorial on how to add AppSync Unified from Cydia to iOS 8. Just follow the steps and get apps. Adding Appsync is very similar to adding any other source. Earlier I have shared other post on how install vShare Cydia version and how to add Appcake from Cydia to iOS 8. vShare and AppCake are very cool alternatives to Installous. After the shutting down of Hackulous finding free cracked apps was becoming very difficult but these communities iFunbox and vShare did came to the rescue. Just add AppSync from Cydia and continue downloading free apps to your iOS device. Firstly, as we are downloading AppSync from Cydia. You need to have jailbroken iOS device with Cydia installed on it. Your iPhone, iPad or iPod must be jailbroken. You can use Evasion, RedSnow or TaiG jailbreak tool to jailbreak your iOS device. Many of the jailbreaking softwares install Cydia automatically on your iOS device after jailbreak but if they don't just install Cydia manually. Also be connected to wifi. It will facilitate downloading at a faster speed and will save time. 1. Tap the Cydia icon on homescreen to open it. 2. Go to "Manage" -> "Sources" ->"Edit" -> "Add". 3. Now it will as for the Cydia/APT URL. Now here you have to enter the URL of any Cydia source from where we can download AppSync. Here enter the official URL recommended for downloading AppSync i.e "http://cydia.angelxwind.net". Then tap on "Add Source". 4. It will now show you a warning message. Just tap on "Add Anyway". 5. Once you have added the Angelx Wind repo, go to Cydia and search for "Appsync Unified". 6. In the search results choose the official Appsync Unified version. Official version is distributed by Karen's Pineapple Repo and authors are Linus Yang, Karen Tsai. 7. Choose the "Appsync Unified" and tap the "Install" button on the top right corner. Appsync will now be installed. After the installation you can now freely download and debug the apps without the use of Apple's developer programs. Just open the AppSync Unified and download cracked apps on your iOS device for free. Also see - Cydia apps to customize slide to unlock text. So this was the simple tutorial on how to add Appsync Unified from Cydia to iOS 8. Hope you have successfully install the app on your iPhone/iPad. Just try other alternative like AppCake and vShare to find which one serves you the best. And use Appsync to run them on your iOS device. Also do remember that these communities share free cracked apps so that you could download and try them for free. But if you like any app just buy it from the iTunes store and do respect the work of the developers.